The past few weeks have been “sick baby” week. Phoenyx spent Thursday-Monday fighting a fever. And honestly I could dub this entire winter as sick baby year, but since it comes and goes I’ll just stick with being an optimist and say the week. Thankfully there were no other symptoms but even a fever can be frustrating for a parent. I should have known it was coming because the week prior he wouldn’t touch food and this kid loves him some food. 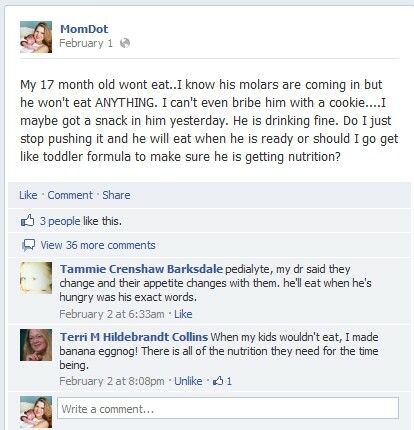 I had actually gotten a little worried and asked my Facebook page for tips on getting him to eat and there were a ton of answers but most said a baby will eat when he wants to eat. I always keep yogurt in the fridge. Phoenyx really likes the yo-baby and it comes in a ton of flavors like blueberry, banana, and today I picked some up with sweet potato in it. Charlotte prefers the yogurt that comes in a pouch that she can squeeze so my fridge has both kinds. I keep tons of cheese in our home. I like cheese that I can slice a bite off of but also buy cheese sticks and shredded. Phoenyx doesn’t mind picking up shredded cheese and its often a “side dish” on his plate. Recently I have been putting a few items he can choose for himself in a bowl and making that accessible to him. I add things like raisins, cut up strawberries, different flavors of goldfish and several cereal selections. I also give him a fruit snack bowl and I like to have that include blueberries, strawberries, cantaloupe, and watermelon. When he can decide when to eat instead of me picking, he tends to snack more. I was the only person in my family that enjoyed cottage cheese till P came along. He loves it too! Its a very easy and soft meal for him to choose and he enjoys it. The great thing about making up your child a smoothie is that they can sip from it at any time and you can decide which fruits (or vegis) go inside. Who doesn’t love waffles? A fun treat for a child or adult, waffles take minutes to make and are easy to chew. My husband likes his with peanut butter. Another soft food for the baby that has a fever from perhaps teething is eggs. You can add in some cheese as well with this. They say the BRAT diet helps when a child is sick, so this is a great way to get some of the “apple” in your child’s tummy to help with diarrhea. I love that there are so many ways to enjoy Oatmeal. It has such sticking power to fill up a tummy, is relatively nutritious and you can even add fruit. 10) Cookies…yep. I figured while my kids are sick if I can get them eat anything, it’s a good thing. Now if your kids are older and able to eat soup, you can try chicken soup, broth, tomato soup, and fiber based foods like bananas and crackers. Even with all that said, keeping your kids hydrated is the most important when sick, so I always try to have my son drink water, milk, Pedialyte and natural fruit juices if he is interested. Heed my warning on the Pedialyte to not overdo that. In my quest to keep him hydrated, I believe it had an adverse reaction and constipated him, which of course made him not want to eat. Of course when your child is sick you may have to turn to a Fever Reducer as well. In 2011, to reduce the risk of over medication, the industry changed to a single concentration formula, which means that new infant acetaminophen products now have the same concentration levels as children’s acetaminophen products. With this change to a consistent single concentration of 160mg/5mL for infants’ acetaminophen products, it required the development of new dosing directions. For PediaCare® Infants Fever Reducer / Pain Reliever with Acetaminophen, caregivers should use the following chart to determine the proper dose for their child based on formulation of the product they are using. 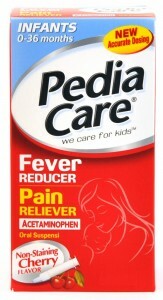 PediaCare® Infants Fever Reducer / Pain Reliever with Acetaminophen is the number one branded infant acetaminophen product currently available on the market. Amidst recent recalls of other brands, PediaCare® has been and is still here for parents and caregivers to provide effective and safe relief to children suffering from fevers due to colds and the flu. PediaCare® Infants Fever Reducer / Pain Reliever with Acetaminophen temporarily reduces fever and minor aches and pains due to common cold, flu, headache, sore throat and teething. Safety and proper dosing is a priority for PediaCare®, and it was one of the first brands to introduce a syringe-based dosing system for infant acetaminophen products. The easy-to-use syringe and spill-proof design allow for safe and accurate dosing. The one-way flow restrictor on the bottle means that the medicine can only be removed with the use of the provided syringe and the single concentration formula helps avoid dosing confusion. Of course if you have any fool proof foods you think your kids will eat while sick, please leave those below! The best experts are moms like you and tips are always welcome! Another food that is good and easy for a sick baby to eat is cream of wheat or Farina. Doesn’t take too long to make and with a little sugar my son devours it. Poor Phoenyx — molars killed Jude’s appetite too. I think we have all the teeth in now, so hopefully he’ll be happy and fine till the 2 year molars. I pinned the post — it’s a great list!